Joseph G. Cline, 66, of White Township, died on Thursday, April 14, 2005 in Lehigh Valley Hospital, salisbury Township. 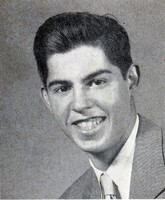 Born: On May 28, 1938 in Easton, Pa. he was a son of the late Walter and josephine Coullura Cline. Personal: He and his wife, the former Lorraine A. Calafiore, observed their 43rd wedding anniversary on September 23, 2004. Joseph was a private first class in the Army from 1961 to 1963, and served in France and Fort Lee, Va. He worked for Victaulic Company of America, Easton for 37 years, retiring in 2000 as a core room supervisor. Joe will be remembered for his love of his family, especially his grandchildren, Jacob and Margo; his love for woodworking; being a New York Yankees fan, and traveling extensively throughout the world. Survivers: In addition to his wife, Lorraine and grandchildren, Jacob and Margo, he is survived by a son, Patrick W. and his wife Georganna of Bethlehem, Pa; and a sister Frances Young of Easton. A brother, Walter died earlier. Memorials: Those planning an expression of sympathy in Joe's memory are asked to consider the Pulmonary Fibrosis Foundation 1440 W. Washington Blvd., Chicago, IL 60607, www.pulmonaryfibrosis.org/donate.htm.